This is the trendy beach city of Cambodia. I will leave tomorrow for this beach as Phnom Penh is not so great in the area I am located, I have to believe there are more friendly areas of backpacker, the one here in this area are like the locals sort of misfits or out of sorts, not so happy and definitely not quick to smile. The beach is maybe 4 hours by bus and the book says the road is good, I would have left today, but the easy trip to the place left at 7:15 and I could not pack quick enough. I almost never stay on one or two nights in a place, but this Capital Guesthouse is about the most desolate guesthouse I have entered in a long time. No common area, and just plain crowded outside the room on the street, just a mess and the guesthouse has the personality of a blind person that cannot talk. 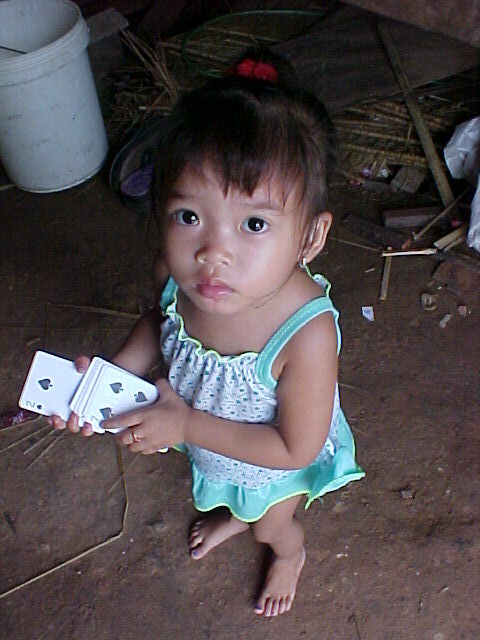 Vietnam Child living in Siem Reap I believe, she was living along river in house with Vietnam Boom Girl. Arrived yesterday to Phnom Penh by fast boat, I suppose the trip was comfortable, but generally the trip was not very interesting. The most interesting part of the trip was leaving the docks at Siem Reap as we was shuttled by small boat to a large boat. 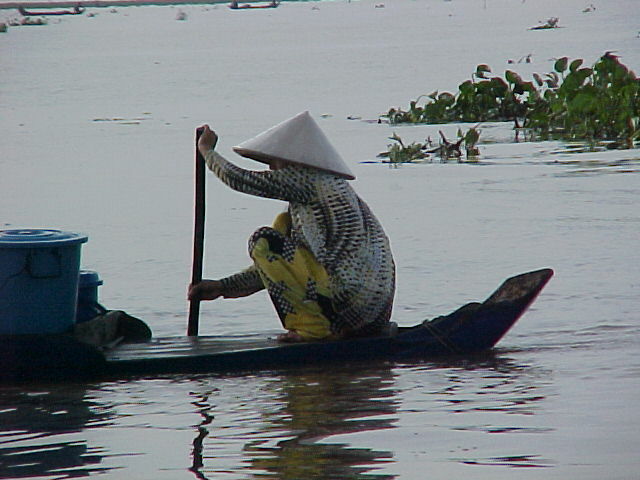 There were floating houses and houses on legs, lots of either Vietnam or Chinese looking people, at least they had on pointed hats of what I would call a field workers hat as I have only seen it on workers in the rice fields. It is possible the bus trip would see more, but not as comfortable, I like a boat because I can read on a boat and the time goes faster, the boat was air conditioned, but that did not last long and most of the people were laying on the top enjoying the cooling air as the boat sped down the river. At the dock there were hundreds of people from Guesthouse to meet us and it was a zoo, I decided with a guy by the name of Justin to go to the Capital Guesthouse, I think this was probably a mistake, but I will not be sure until I go to another place. It is a depressing area of town although probably a great place to re-stock on supplies for your backpack as the area is full of vendors and there is an extremely huge indoor market across the street. But the place closes up at night like a small town in El Salvador and you see no one but the ever present and annoying taxi motorcycle drivers. They just never stop asking for a fare, the English here is maybe the same as a Thai Tuk Tuk driver or taxi driver. The hotel staff has no face and does not smile, I am not sure what is going on with Phnom Penh, but so far this place is not a lot of fun, full of culture but not so happy. The Capital Guesthouse cost me 2 dollars U.S. The like dollars and dollars are used everywhere or can be use, but if you pay with a dollar the change is in Cambodian Real. It is in the Psar o Russei area of Phnom Penh. The guidebook said that Boeng Kak area is the Backpacker Ghetto and closes to being like Khao San Road, I think I will leave for the beach and then return to this area for a couple of days. I still need to get my Visa to Vietnam so I am going to have to find information, but for sure this area is not the fun area. I got some good photos of Justin from Brighton Area of Boston, USA with an Canadian Flag on his Bag, he wants to be a doctor then wants to be part of the Doctors without Borders system. Obviously he is willing to lie so I am sure I do want him for a doctor. Not a good representation of the USA or a good Ambassador of the country. DEBATE - AM I READY TO LEAVE? 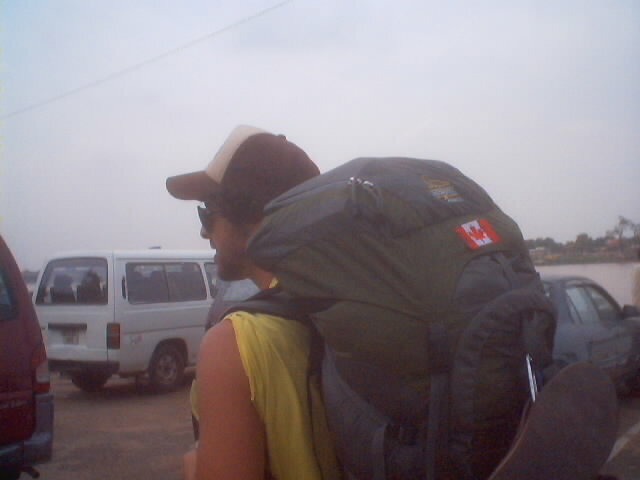 It is about 5:00 AM in the morning, the van or bus comes to pick me up at the hotel at 6:00 and I want to be prepared. It is hard to believe that I can even worry about catching a bus, plane, train or other after this much time of travel, but I still sit around debating if I am forgetting anything. Last night I exchanged 20 U.S. for Cambodia Real they have me 80,000 Real so I have enough to for miscellaneous purchases I realized yesterday the internet café wanted one dollars and twenty cents for the use of the internet, I was sitting around deliberating, I do have a few U.S. coins and they would really crap if I gave them U.S. coins as I think they have no use in Cambodia, they do seem to use the Dollars, but they do not use the coins, or at least I have never seen a coin yet, everything seems to be rounded or made to fit to an even number, this is a great way to squeeze an extra 20 percent profit off the top, so if I have the Khmer money than I can pay exact and not worry. It is basically 4000 to the dollar so 1000 is 25 cents U.S. I think about trying to give math cues or hints on how to think about money, but how do you give a money hint that will continue to work. Really the money in Cambodia is the same as Thailand but you just add two zeros. 40 Baht more or less equals one dollar in Thailand, so you just divide everything by 40 or 10 Baht is twenty-five cents U.S.
That is all easy for me to say who has a very good calculator built into my brain and can make instant conversions, but for the average Joe Blow they need to carry a calculator or lose money on a regular basis, my friend Jeff in Mongolia and India always had a calculator, and I will use a calculator for big money or when I am even a little worried, sometime the number of zeros is just too much. I also have to debate on how to dress for this trip. I want to where my normal travel pants with all the pockets, but when you could be cooking in the sun for 6 hours it would be nice to have some shorts, so I am going to carry some shorts in my day pack or front pack in the event I want to change. All this comes down to a safety issue or just the fact that I could lose something or misplace something. When I move from place to place my travel pants have more pockets than needed and my passport has a pocket, my wallet has a pocket, my spare change has a pocket, my ticket has a pocket, and my keys, and computer thumb drive memory has a pocket, there is no problem knowing where I am keeping my valuables, but my shorts do not have enough pockets for all of this. I can buy pairs of shorts that have all these pockets, but than I feel like I am wearing long pants because they are heavy, hot, and sort of defeats the purpose of being cool. What I have been doing mostly is using my travel pants as a storage area. I keep everything inside them whether moving or staying in my room, and then I tuck the pants in my bag and lock up the bag, and chain to the bed or something in the room. I really only wear these pants when moving from place to place as they are hot, and I always leave all my money and passport in the room, as I know I am more likely to lose them than have them stolen, and if they get stolen in the room, then everything is gone anyway. I have never really needed my passport on my body except when I am on a train, or bus moving between cities and at checkpoints, or border crossings, so why carry and have all the ink fade when I sweat or basically destroy the passport by having in my pants. I have know lots of travelers that had to get new passports because they got It wet or destroyed their passport because it was always in their pocket. Mine is fat and about 8 years old, and I need a few more pages again, this would be the 2nd time of getting pages, so that is why it a little fat. Siem Reap is getting on my nerves. It is a wonderful place, but after being here before and now being here again, I realize it is pretty and quaint, but really it is just one big tourist trap. I suppose the river and the older building with the stores below lend to a quaint feeling, but every square inch of this city is selling something. I can walk around the city and a motorcycle or tuk tuk driver will ask me every 10 meter or yard if I want a tuk tuk, there are way too many of these guys sitting around. I was talking with my taxi driver yesterday and he pointed out that is was the low season now, and in the high season this place is wall to wall tourist, I cannot imagine this place in high season, it would be worst than Paris, and I am sure they really go for the gouge on the travelers, extorting cash in any cute way possible. I say this because small things like water can go up to 200 percent in tourist area. Right now they are competitive and a little hungry, but when the place is full then greed kicks in and they start really become rude and not helpful. I suppose if you wanted to see if a hotel is nice or not nice you need to come during full occupancy and see if they are friendly. I was laughing the Peachy in Bangkok was empty a month ago and the management was really nice for a week, but a week later they was back to that I do not care attitude. Most hotels I enter in Thailand just do not care ever, so I do not worry much about them being friendly, the cleaning people are the friendly ones and the reception desk at the grouches. I say hello to the staff almost 90 percent of the time as I enter a hotel, this is probably just me being Indiana polite, but it is also interesting to see if they even reply, you would be surprised that only about 10 percent of the time the reception desk will even acknowledge I enter the door. Even when I speak in their language and say hello, it is easy to ignore other languages than your own, so I try to say hello in the local language, the idea of saying hello and acknowledging the presence of other is not a common act in the world, less than 10 percent of people will even look or make eye contact. This includes the other travelers. I do find this is a great way to separate friend from no friend though, and I can look at people and if they are too afraid to say hello, they are probably too afraid to be my type of friend. I like people that talk to everyone. Well, I got less than one-half hour to go and I better pack up the final and put on some clothes. It is very hot and easy to lay around here in as few a clothes as possible.